Westview High School is smoking with their production of �Out of the Frying Pan�, a story about cramming 6 would-be actors into a small New York City brownstone to make ends meet while trying to land their big break. How fortunate for them that living downstairs is a successful Broadway producer (and want-to-be chef) who has a huge hit running and is gearing up to cast a road company. The roommates spend night after night rehearsing the very same hit show hoping to prove to the producer, Mr. Kenny, (Jilhoon Im) that they are perfect for his cast. When Mr. Kenny runs out of a crucial ingredient for his gumbo and comes upstairs to borrow some flour, they finally get their chance, and a heaping spoonful of chaos and a full course of hilarity are served. Connor Bush was cooking with gas as Norman Reese, bringing a non-stop high octane energy that was the fuel for this perfectly baked comedy. Along with roommates George Bodell, played by Sanket Padmanabhan, and Darien Stupack playing the role of Tony Dennison, the three male roommates bring a slapstick element to the production that keeps the show simmering with non-stop laughs. Add to this mix, Annie Buell as the sarcastically tart Kate Ault and Amanda Floco as Marge Benson, and complications start as none of the other roommates know that Marge and Tony are secretly married. The sixth roommate, deliciously daft Dottie Coburn, played by Katherine Heflin, was superb as the saccharine sweet yet stupendously stupid roommate with the bank-rolling dad, played by Brandon Axtell. The roommates� recipe for success is going well until they need a dead body, so Kate whips up a Mickey Finn for the unsuspecting personal assistant to Dottie�s dad, Muriel Foster played by Kirsten Miller. So well does she take on the role of Dead Body that the screams by cast mate Marge bring the landlady, played riotously by Abby Broekema, along with the clueless cops played by Jessica Frenkle and Evan Loefstedt. As the cops grill the suspects, the landlady sits, dense as dough, believing she is watching the roommates performing a play. The setting, designed by Ales Howard, Christine Li and Snow Zhu, was not only completely functional, it was fun in its own right, including a shrine to Stanislavski, the Julia Child of the acting world. Costume designer Shreya Carey brought the icing for the cake with the gorgeous costumes. Directors Kristen Ace Nevarez and Chris Wollman, along with their student production team, created a feast of funny and the audience ate it up whole heartedly. 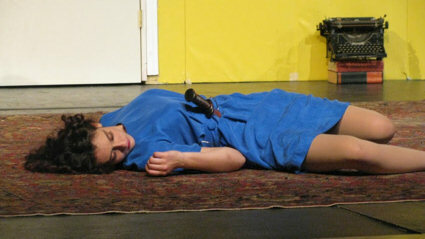 Performed October 28th � November 6th, 2010.